Public meetings hosted by state DOTs can be very frustrating. People who want safer streets and take the time to attend are often deluged with highly technical excuses about why their suggestions won’t fly. Andy Singer at Streets.mn, known for his excellent cartoon work, says he’s done for good. 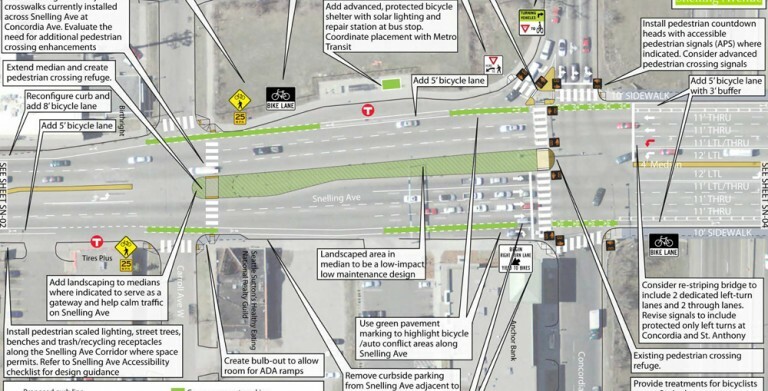 He’s never attending another Minnesota DOT meeting after devoting “at least 100 hours” to what was supposed to be a “multi-modal” plan for Saint Paul’s Snelling Avenue — one of the most dangerous corridors in the Twin Cities region. A plan is a promise from a government agency that it is going to do certain things for the community. I and other community members invested thousands of hours of our time in a good-faith effort to come up with the Multi-Modal Plan. By throwing out large portions of it, MnDOT wasted our time, betrayed our trust, and wasted public money. As they’ve been doing for over seventy years, MnDOT demonstrated that they simply don’t care about public opinion or the communities through which their enormously destructive highways pass. They constantly solicit public feedback for plans like this, or for “Minnesota Go”, or their statewide bike/pedestrian plans. In fact, it seems like their bike/ped division has done nothing for the last twenty years except draft plans that are never implemented. We sit in rooms with facilitators and stick post-it notes on maps, or watch presentations about “how much the agency cares about our input,” and break into meaningless little discussion groups. In retrospect, it all appears to have been a waste of time, and I will never go to a meeting with MnDOT again. It’s like when politicians appoint a “Blue Ribbon Panel” and then ignore its recommendations. After a few of these, people stop participating because they realize it’s pointless. Elsewhere on the Network today: The City Fix shares research about the effect of Bogotá’s TransMilenio BRT on public health. And Cyclelicious reports that Oklahoma is considering “Idaho Stop”-style legislation. North Carolina DOT plans to make an unwalkable commercial street even more dangerous.